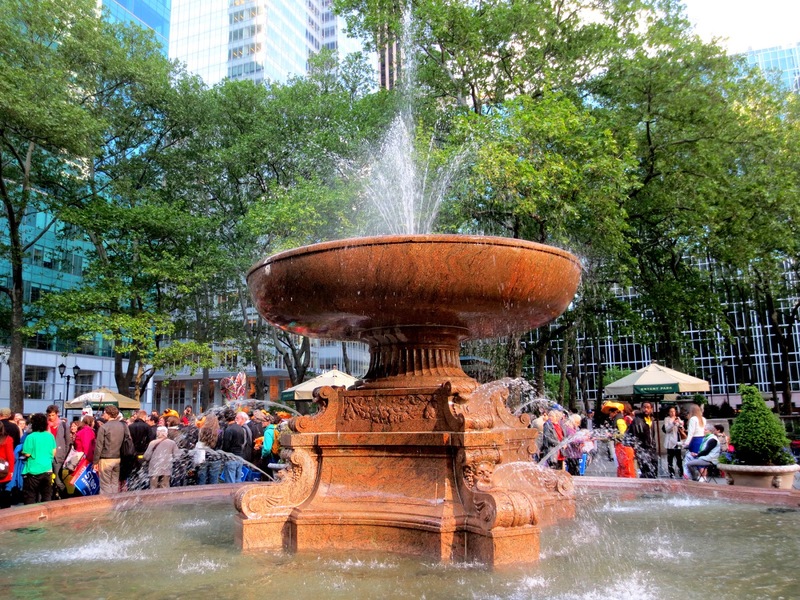 Bryant park is in Midtown Manhattan just blocks from Times Square and the theater district. It is small but well well-cultivated retreat that that hosts a dizzying schedule of free entertainment during the summer. 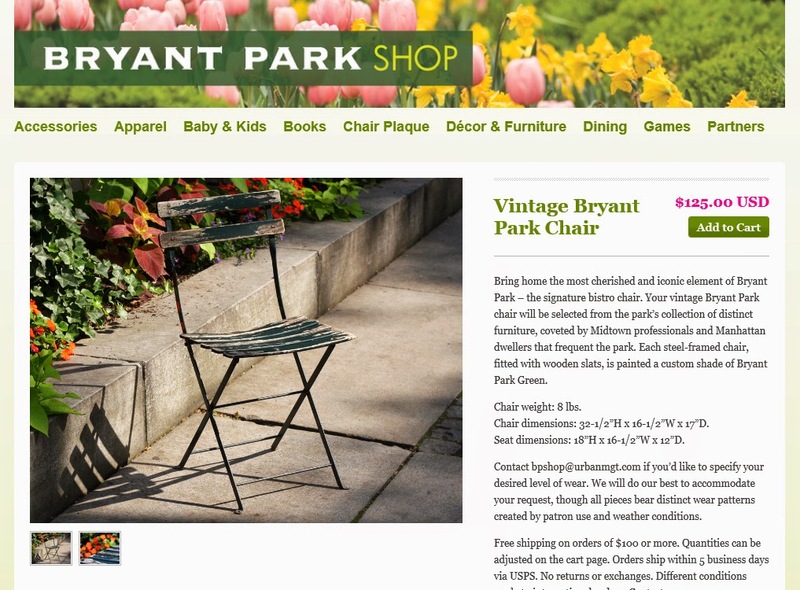 The park has a long history –look at the post 1 about the park in my blog. In the 1970s New York was in a decline and the park became a very dangerous place , "no-go zone" because of the drug dealers who were not visible from the streets because the park was elevated and isolated by the tall bushes. 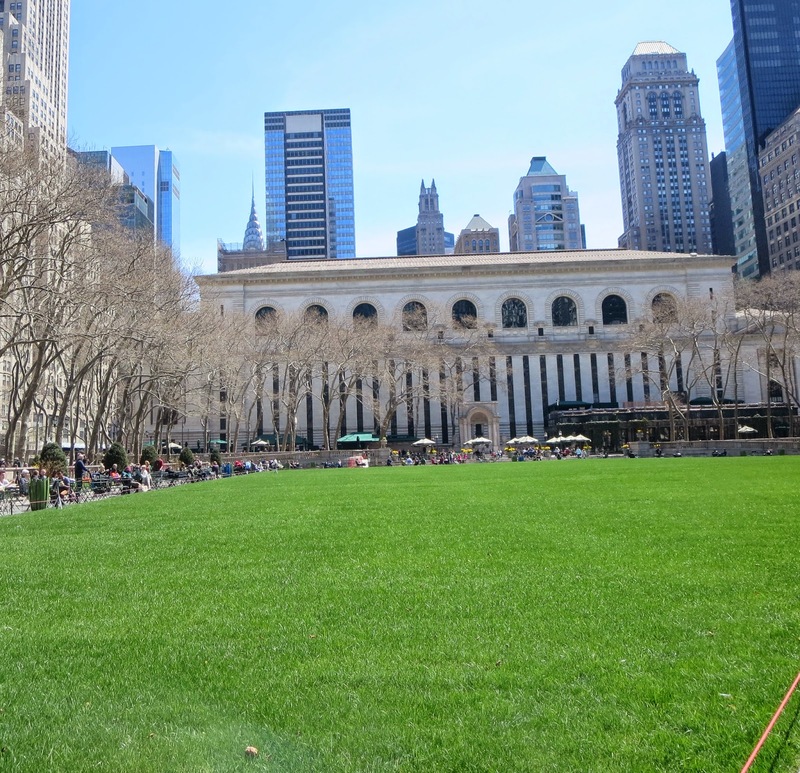 In the late 1970s the Bryant Park Restoration Corporation (BPC) was founded by the Rockefeller Brothers. In the 1980s, the park was closed to the public. It was excavated and rebuilt entirely over an underground structure which houses the New York Public Library's archives. After a four-year effort, the park reopened in 1992. In 1991 BPC purchased 400 sturdy, white stackable chairs. 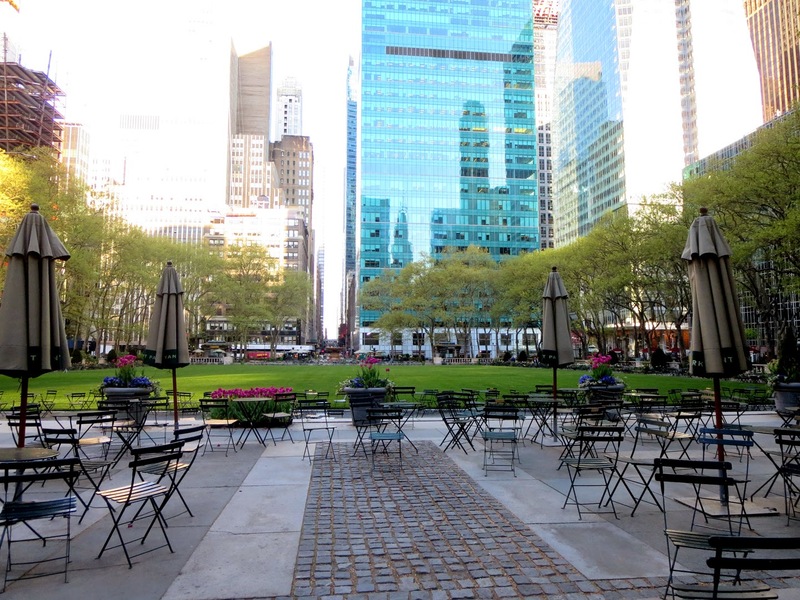 In 1992 the white chairs were replaced with the now iconic, green Fermob chairs, now available for purchase in the Bryant Park Shop. Now the space holds 800 tables and more than 4,000 green chairs . William H. Whyte, the American sociologist , wrote in his book “The Social Life of Small Urban Spaces” "Chairs enlarge choice: to move into the sun, out of it, to make room for groups, move away from them. The possibility of choice is as important as the exercise of it. If you know you can move if you want to, you feel more comfortable staying put." There is a the Josephine Shaw Lowell Fountain in the West part of the park. Josephine Shaw Lowell was a Progressive Reform leader and is best known for creating the New York Consumers League in 1890. 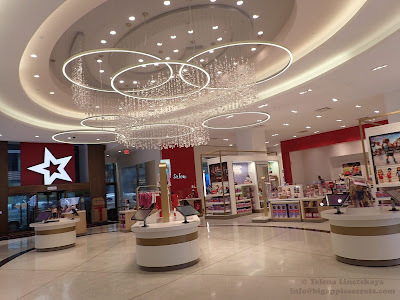 Josephine published a "White List" that contained a list of stores known to treat women workers. 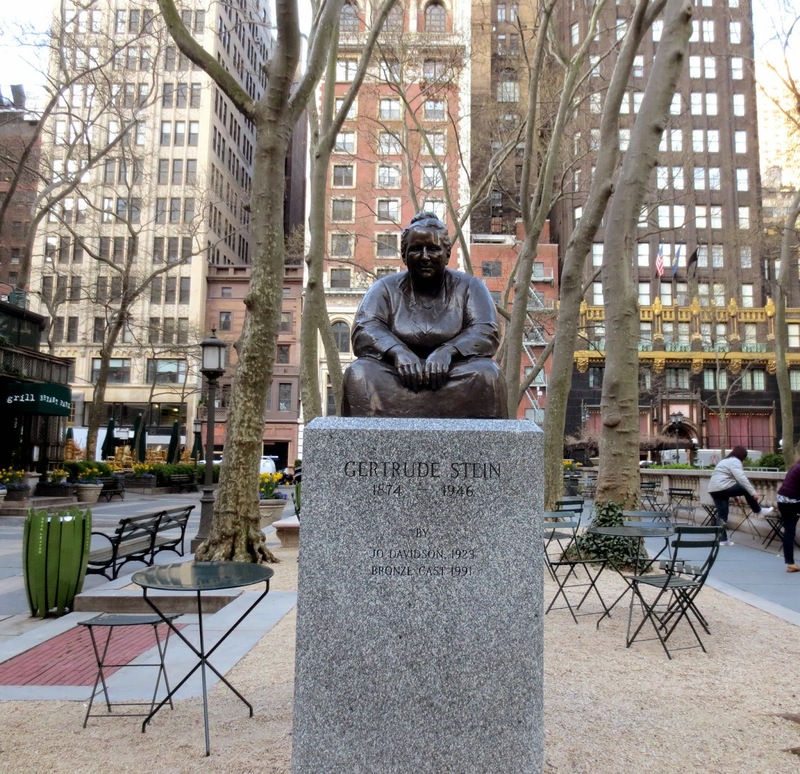 The fountain, built in 1912, is New York City's first public memorial dedicated to a woman. 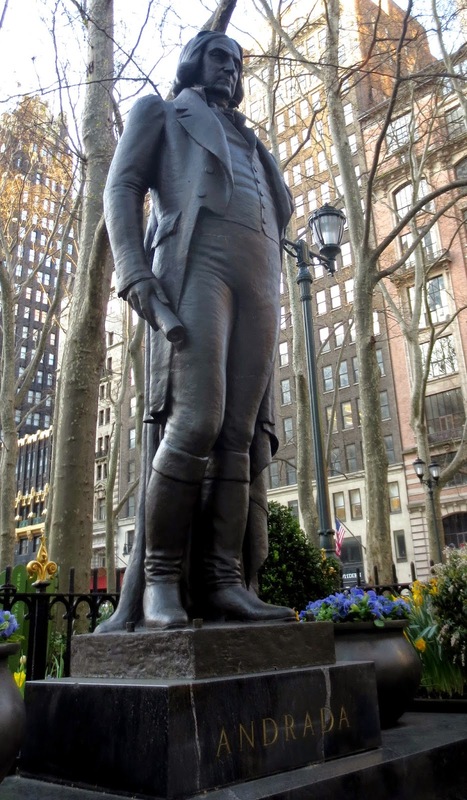 The collection of the Bryant Park statues, except the monument to Bryant, is a little bit strange- the only thing that all these people have in common is that they have nothing to do with the park. On the north side of the park is a fine statue in bronze of William Earl Dodge, Phelps, Dodge & Company, and philanthropist. 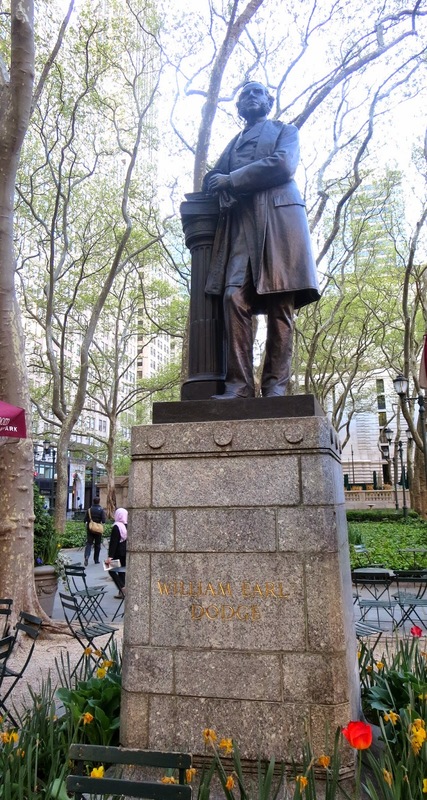 The statue was dedicated in Herald Square ( near Macys department store ) in 1885. In 1941, when Herald Square was renovated, the Dodge statue was moved to its present location. On the opposite side of the park there is a bronze bust of Johann Wolfgang von Goethe, the great German writer. 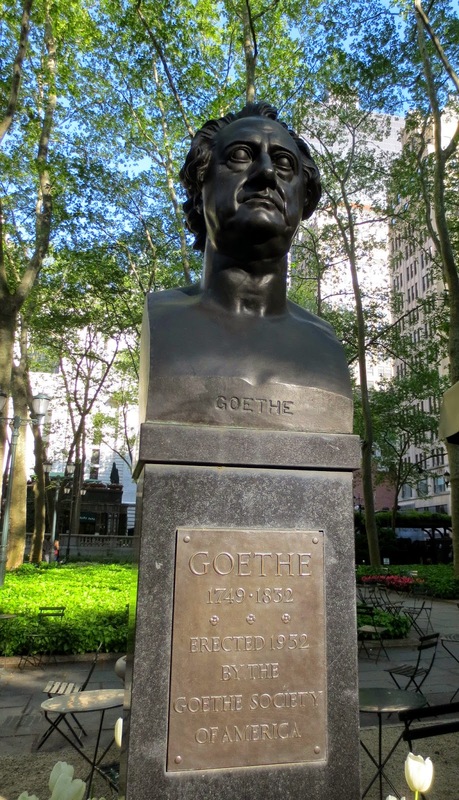 The Goethe Club of New York purchased it in 1876 and donated it to the Metropolitan Museum of Art and the museum in turn donated it to Bryant Park in 1932, the centenary of the writer’s death. There is also a bust of the American writer Gertrude Stein, a statue of José Bonifácio de Andrada e Silva, Brazilian statesman, naturalist, professor and poet ( a gift from the people of Brazil) and the newest addition, the statue of Mexican national hero Benito Juarez, Mexico’s first president of Indian descent - the first Mexican figure to be placed in the city of New York ( a gift from the State of Oaxaca).